Companies are continuing the transformation to the Industrial Internet of Things (IIoT) characterized by digital, highly automated “smart” systems in virtually every vertical industry. As they do, it’s driving new requirements for machines in industrial settings. In short, the machines can’t lose data – so they need industrial UPS protection. The end user companies that buy those machines rely on them not only to perform their intended function– whether filling soda bottles or packaging pharmaceuticals – but also to feed data to other systems that track production, inventory and more. Even if the machine itself should fail for some reason, customers can’t afford to lose the data they hold. That means machine builders have to ensure the machines are properly protected with an industrial UPS. In some cases, the machines may need an industrial UPS that’s large enough to keep it running in the event of a power failure. A high-speed machine can suffer damage if it unexpectedly stops short, for example, and thus should be protected against power failure. That raises a good point, which is that industrial UPSs not only protect machines and data in the event of a power failure, but actually help the machine function better over time. No power grid is immune to disturbances that can cause spikes, jitter and other types of power problems. Over time, these anomalies can cause damage to the sensitive electronics that are intertwined with modern industrial machines. An industrial UPS will neutralize these problems and deliver only “clean” reliable power to the machines. The ability to detect and normalize spikes and surges will help protect machines from damage and improve their performance over time. 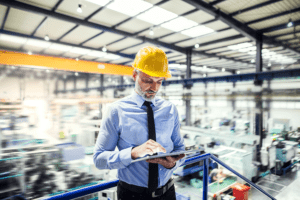 That, in turn, will help improve the Overall Equipment Effectiveness (OOE) for a manufacturing facility, which is a measure of overall productivity. Additionally, many industries have regulations that require strict controls on production and quality. The pharmaceutical industry, for example, requires companies be able to trace the production flow from start to finish. Similarly, most countries have traceability requirements for the food industry. Such regulations bring us back to the importance of the data industrial machines collect. If the data is lost due to a power failure, it could mean a pharma or food company has to trash a complete production run. An industrial UPS that keeps data collection systems running during a power failure can help prevent such a fate. Such systems require what we call critical power protection, which involves protecting your automation system by providing the best power quality and availability. That, in turn, helps you and your customers improve service continuity, productivity and competitiveness. Machines builders can integrate two general types of industrial UPSs with their machines. A single-phase UPS is good for smaller loads, such as PLC, HMI or motion control components, to protect that valuable data. It may also be suitable to provide a few minutes of runtime for smaller, discreet machines in the event of a power failure. Larger machines require 3-phase industrial UPSs, which provide consistently “clean” power to protect machines and are powerful enough to ensure one or more machines can remain functional in the face of a power outage. They are a good option for those high-speed machines that could suffer damage if they come to a sudden, unexpected stop. With a 3-phase UPS, the customer will get enough run time to properly, and safely, shut down the machine. Today, numerous models of each type of industrial UPS can also be outfitted with communication cards that enable them to be fully integrated with automation architectures. Users can then check UPS and power input status from wherever they may be, conduct remote monitoring and receive alerts regarding maintenance issues. If a battery on an industrial UPS is nearing end of life, for example, users will be alerted so they can take corrective actions. These are the types of capabilities customers expect as they retool plants with Industry 4.0 technology. To learn how to fulfill these expectations, you can review the latest UPS options that are now included under Schneider Electric’s EcoStruxure Plant & Machine solutions. Also, discover how machine builders can continue to partner with their customers to maintain uptime and productivity by exploring our Industrial Business Continuity site.